This hunt board is a copy of one Garrett Hack published in Fine Woodworking several years ago. The base is maple with black milk paint over Burgundy stain, lightly rubbed off and waxed. 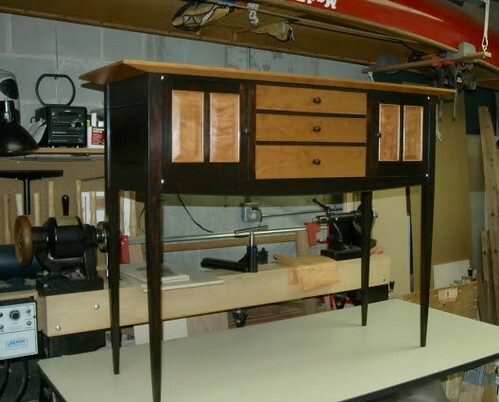 The natural top and drawer fronts are curly cherry finished with Waterlox. The Secondary wood is pine. beautiful work really shows your craftsmanship well.welcome to lumber jocks,cant wait to see more from you. This is a very attractive looking piece… and the execution looks flawless. I’ve never heard of using milk paint over stain and then rubbing off, but it looks great. Nice job, that’s a great looking piece. 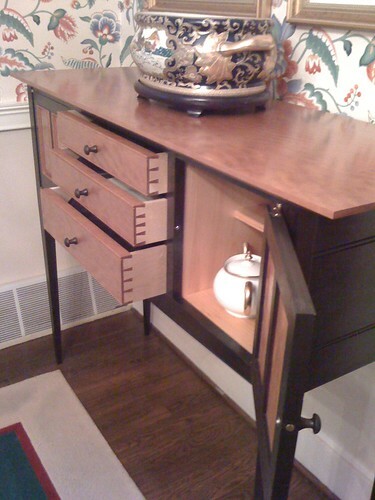 Very nice cabinet, attractive and beautiful, thanks for showing. Beautiful! Great job with the dovetails and overall outstanding craftsmanship. Woe! Incredibly well done. Nice color selection and execution. Nice Project & Well Done! Beautiful selection of wood and colors. Great styling too.